The fatty acids in almonds are mostly oleic (60%), which are resistant to rancidity. However, about 25% of the fat is polyunsaturated, which goes rancid quickly upon exposure to air and light. When these delicate fats are contained within a whole almond, they are protected. Once ground they quickly go rancid especially when packed in clear plastic bags, which lets in light completely unobstructed. Think about the length of time it takes for the following steps to occur. Grinding almonds into flour at the factory. Shipping to the company warehouse. Sitting on a store shelf. You buy it and it place it in your pantry. This can be weeks or even months long! There is little doubt that almond flour from the store is either partially or completely rancid by the time you use it. Rancid flour is loaded with free radicals – you don’t want this in your body as it can exacerbate health problems! Another issue is that almonds are quite high in anti-nutrients such as phytic acid and oxalates. Simply grinding them up to use in baking recipes is not sufficient to neutralize these substances. Almonds need to be soaked/dehydrated OR sprouted before grinding into flour to minimize these gut irritating substances. Once you realize how easy it is to make fantastic quality almond flour, you will never go back to buying it! Here are a couple of tips I’ve learned along the way. First, be sure to avoid grinding almonds in a grain grinder. Nuts are too oily for most grain grinders to handle. It gunks up the mechanism and otherwise makes a mess. Second, if you try using a food processor (unless you have a Vita-Mix), that doesn’t work so well either. Most models don’t grind the nuts finely enough to make a good baking flour. The solution? Use a good quality electric spice and coffee grinder that easily disassembles for easy cleaning. This is the spice/coffee grinder I use. It has two attachments. One for coarse and the other for fine grinds. It makes fantastic homemade almond flour or meal. It is also very inexpensive. Once you have the right equipment on hand, you are ready to make your own almond flours. Almond flour from either soaked or sprouted nuts is fine. They are both very easy to digest and extremely nutritious. Soaking and dehydrating nuts before grinding into flour is a time consuming process. If you go with this approach, I suggest making large batches and then refrigerating. Be sure to use raw, unpasteurized almonds if possible. If you wish to make fresh almond flour for each recipe, I would recommend using sprouted almonds (this is where I buy mine). Sprouted almonds can be made into flour immediately with no special preparation. 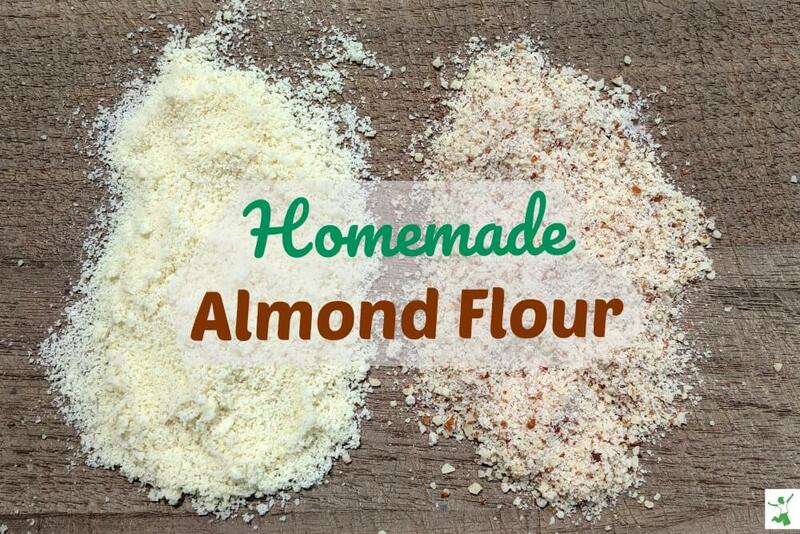 It is the best type of almond to use for making homemade almond flour in my opinion. I use it most often to make almond flour pancakes or low carb pizza crust. Blanched almond flour is simply flour from nuts with the skins removed. I don’t recommend baking with it because much of the nutrition has been stripped away. That said, if you must use it due to sensitivity or another reason, you will have to soak raw almonds overnight and then remove the loosened skins before dehydrating. At that point, you can grind the dried, skinless almonds into blanched flour using the same process as whole nuts below. Pour almonds into the food holder of your electric grain/spice grinder. Be sure to use the correct attachment for nuts. Pulse until almonds are fully ground into smooth flour. Makes about 1 cup. Use in baking recipes immediately and refrigerate any leftovers.